The next morning, we woke up bright and early thanks to Raouf, who left a wake up call for us, with an appointment for breakfast downstairs at 6:30 am. We had a traditional Israeli breakfast consisting of feta, various other white cheeses, yogurt, hummus, olives, hard boiled eggs, fresh fruit, cut up hot dogs, rolls and juices/milk. Then we loaded onto the tour bus to leave the Hotel Ritz in Jerusalem at 7:30 am. First, we headed east to the Dead Sea, then south along the road that runs along its western shore to Masada National Park. Masada is a UNESCO World Heritage site– a 1st century BC mountaintop fortress from the Hasmonean Period built by “Jonathan the High Priest” (aka King Alexander Janaeus; 103-76 BC). Herod, who ruled from 37-34 BC, would later build a winter palace and refuge from enemies over a century later. 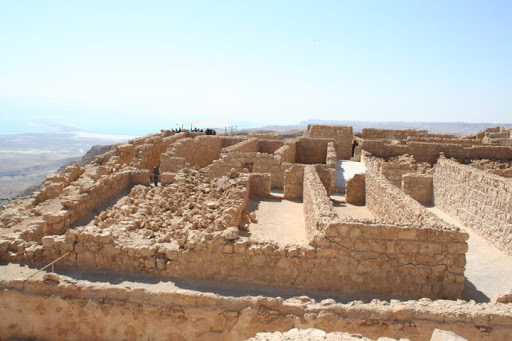 Masada is most famous for the siege of the fortress by the Roman legion, which was precipitated by the Great Revolt. According to the writings of Josephus Flavius, the Roman Tenth Legion led by Flavius Silva, laid siege to the mountain. Those inside were a mixed group of Jewish zealots, including Essenes and Samaritans, revolting against the Romans (i.e., the Great Revolt). They were known as the Sicarii, a name that came from the curved dagger—the sica—they carried. 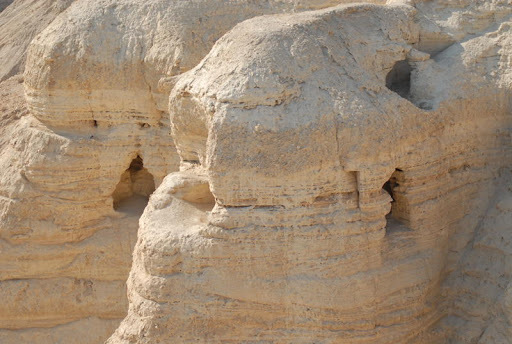 The rebels had fled to Masada after their leader, Menahem, was murdered in Jerusalem in 66 AD. After several months of siege, the new leader, Eleazar Ben Yair gave two speeches urging his men to kill their families, then themselves. The last ten men (chosen by lot) were to kill the rest of the men, then cast lots among those ten to choose who would kill the other nine and then himself. There had been 960 people in all. When the Romans finally broke through, they found only two women and five children alive, who had been hiding in cisterns on the mountaintop. They told the Romans what had happened that night, on the 15th of Nissan, which is the first day of Passover. After hearing this story, the Romans were so moved by the rebels’ determination to live free, they decided not to kill or enslave the women and children. 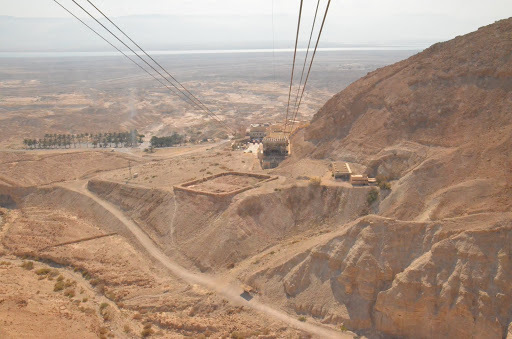 After watching a short movie on the aforementioned history of Masada, we took a cable car to the top of the mountain. The views of the Dead Sea and the Judean Desert from this vantage point were incredible. Besides the cable car, some people actually choose to walk to the top via the Snake Path, which as its name implies, is a winding path that snakes up the mountain. Though the park’s brochure states that it takes 45 minutes to reach the top via that path, we all agreed from our vantage point it looked like at least an hour climb. Once at the top, we saw ruins from the Classical Period, built by Herod. One of the most impressive of the many sites on the plateau is the remnants of his Northern Palace, built on three rock terraces overlooking the gorge below. The remains of a large Roman style Bathhouse is just south of the Northern Palace and consists of the dressing room with fresco-adorned walls, the tepid room (tepidarium), the cold room (fridgedarium) and the hot room (caldarium). Another remarkable feature from Herod’s time is how he engineered a means to provide water in the desert to a mountaintop fortress. As you stand on the northwest corner of the mount, looking out towards the Judean Desert and Ein Gedi, you can see the brilliant water system Herod devised to provide ample water despite the arid climate. This area is known for having sudden flash floods, so Herod constructed dams that diverted floodwaters to channels leading to 12 cisterns hewn on two levels into the rocky slope. These cisterns were plastered on the inside so that water would not seep out through the rock. These cisterns collected almost a million gallons of water. Slaves then brought the water up to pools, the bath house, etc, using pack animals. There is also an interactive model here to demonstrate Masada’s water system. 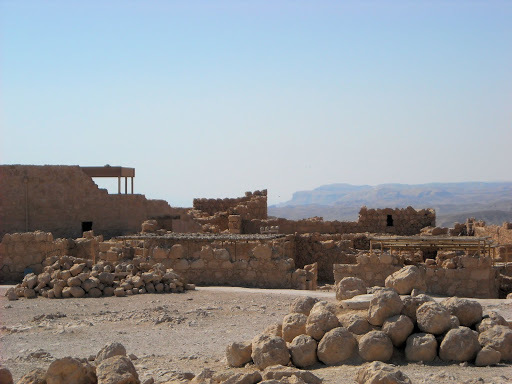 After the Romans left Masada, the fortress was uninhabited for centuries until the Byzantine Period. During the fifth century AD, a monastery inhabited by hermits was founded. A well-preserved Byzantine church complete with some mosaic tile flooring can be seen further south on the plateau. With the rise of Islam in the seventh century, the monastery apparently fell into disuse. After a cable ride back to the bottom, we headed to Ein Gedi (En Gedi). Ein Gedi is a nature reserve located on the eastern edge of the Judean Desert, on the shore of the Dead Sea– the lowest place on earth. The extremity in the geographical features encompassed within only 3500 acres of land is amazing. From its highest point of 656 feet above sea level where it meets the desert plateau, it drops to its lowest elevation at the Dead Sea of 1388 feet below sea level, resulting in magnificent sheer cliffs. Two valleys run through the reserve, which is also an oasis: Wadi David on the north side and Wadi Arugot to the south—a wadi is a gully or streambed. 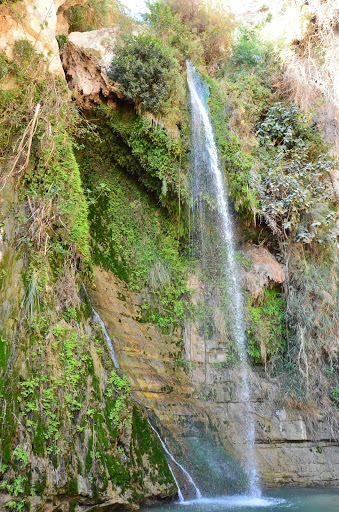 Four sweet-water springs flow in the reserve: David’s Spring flows into Wadi David; Arugot Spring flows into Wadi Arugot, while Shulamit and En Gedi Springs flow between the two wadis. Ein Gedi was the place where David hid in the caves from Saul (1 Samuel 24). We trekked west along the Wadi David trail; it was quite a hike and treacherous in some areas, especially where the trail passed through the water. It was worth the climb for the incredible view of the Dead Sea and surrounding area. When we reached David’s Spring, we found ourselves in a peaceful alcove of sorts– once a cave large enough to hide 300 fighting men. Now transformed by a beautiful waterfall, which in ancient times was so voluminous it hid the mouth of the cave. Thanks to 3000 years of erosion, there is no longer a roof, just sheer cliffs. 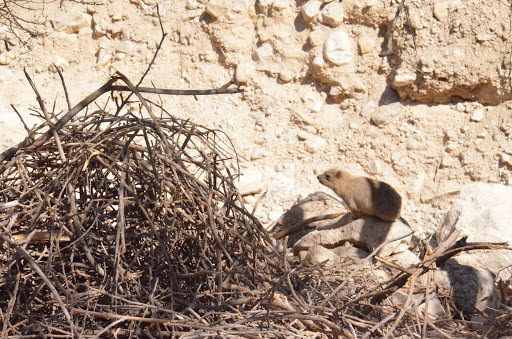 There are two indigenous land animals to this locality: the Nubian Ibex (wild mountain goat) and the rock hyrax (conies). Both animals are mentioned in the Bible, “The high hills are a refuge for the wild goats and the rocks for the conies.” –Psalm 104:18 and Proverbs 30:26: “Hyraxes are creatures of little power, yet they make their home in the crags…” We saw a number of ibex; these creatures seem to defy gravity while walking along the sheer walls of the cliffs and disappearing into their little cave homes. We also caught glimpses of little hyraxes sunning themselves on small crags jutting out along the trail. The cute little brown creatures look a lot like large guinea pigs. The descent from David’s Spring was considerably easier than the climb up, and afforded us one last chance to see the Dead Sea and surrounding scenery. 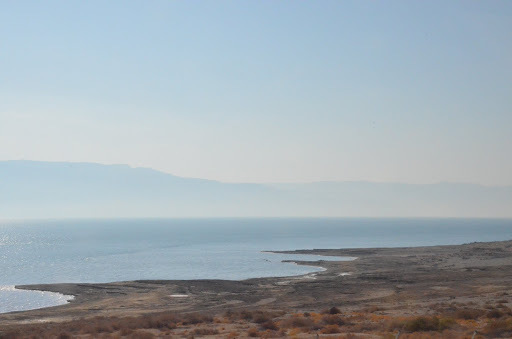 After leaving Ein Gedi, we continued a few miles north on the western shore of the Dead Sea to Qumram—the site where the Dead Sea Scrolls were discovered. The Dead Sea Scrolls are a collection of 972 texts from the Hebrew Bible, found in the 1940’s by a Bedouin boy and his cousin. The scrolls were found in 11 caves in this former settlement. These texts were written in Hebrew, Aramaic and Greek and include the oldest known surviving copies of Old Testament manuscripts. Many scholars believe the settlement was that of the Essenes, a Jewish sect smaller in number than the Pharisees and Sadducees (the other two major sects at the time). From the ruins of the former Essene settlement, which looks out over a gorge, we could gaze up and see caves 3, 4, 5, 6 and 11. Caves 7-10 are on the back side of the mountain from where we were, so could not be seen. Many of the caves were manmade, as they were used for storage and hiding places. The Essenes lived an ascetic life, copying scrolls; among the many texts found, there were 22 copies of the book of Isaiah. The same political unrest that precipitated the events at Masada (i.e., The Great Revolt) led to the Essenes hurriedly hiding their papyri in inaccessible caves nearby as the Roman legion marched in to massacre the settlers in 68 AD. These scrolls remained undiscovered in ‘scroll jars’ for 2000 years. Qumram has a very active visitor’s center which includes a large gift shop and cafeteria for the numerous busloads of tourists that arrive here daily. We had lunch at the cafeteria, and partook of the traditional ‘sandwiches’ and soft drinks. There was a choice of various Middle Eastern hot lunch foods, but of the sandwiches there were only two types: falafel or chicken. Both consisted of a pita filled with salad, fries and either falafel balls or a sesame encrusted chicken patty. Food as well as fuel is extremely expensive in Israel. Soft drinks cost $3- $3.50 per can, while a sandwich and drink combo lunch is typically $10. Every place of business accepts US dollars or Israeli shekels. After lunch, as we continued north along the west coast of the Dead Sea, from the highway, we could see cave numbers 1 & 2 up in the cliffs. 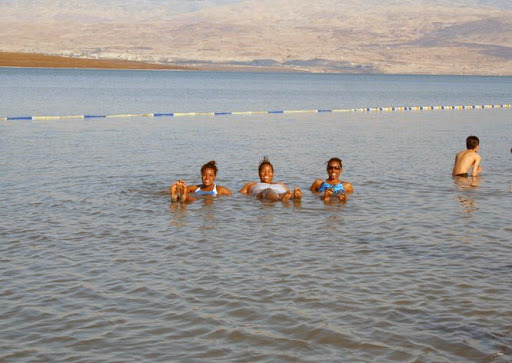 Our next stop was the Dead Sea itself at Kalia Beach. Here, we changed into swim suits and floated in the Sea. As stated before, the Dead Sea resides at the lowest elevation on earth. The Dead Sea has unique properties found nowhere else on earth. The sun rays, water, air and mud are unique to this area alone, making the climate here the most therapeutic combination in the world! The sun rays: according to The Dead Sea Research Center, the sun rays are greatly attenuated (lessened) due to its elevation —1300 ft below sea level, the dense haze that surrounds it due to evaporation, and the ozone layer. This means that the harmful UV rays are neutralized, and the chances of getting a sunburn while lying out on its beaches is very unlikely. The water: the water has a 32% salinity compared to 3% in normal sea water. However, it is also high in magnesium, calcium, bromide and potassium. The combination is said to nourish the skin, ease rheumatic discomfort and relax the nerves. This also means that one cannot swim in the sea, but everyone easily floats. Despite being an excellent swimmer, I have never been able to float without paddling my hands, so it was fun to lie on my back and float effortlessly. You do have to be careful not to swallow the water or get it into your eyes, for it is very caustic. And it does make your skin feel soft and smooth. The air: the Sea has the world’s highest terrestrial barometric pressure, resulting in higher oxygen density than air at sea level. The air is also filled with bromide and magnesium, which helps with nervous tension; also, the air is unpolluted and virtually allergen free. The black mud: the mud is a homogenous mixture of Dead Sea minerals and organic elements and earth. The mud is said to improve and stimulate blood circulation, while cleansing and softening the skin. When we got down to the beach, we did as Raouf instructed: we floated on the surface, then we reached down to the bottom and grabbed mud and rubbed it all over ourselves. Then, cautiously—because the bottom was slippery in places—we walked out to the shore and lay out to allow the mud to dry. Once we were good and crusty, we waded back in and washed the mud off in the Sea. After this, we headed to the outdoor showers to rinse the sea salt off and enjoy the effects of the one-of-a-kind Holy Land ‘spa’ treatment. Later, we changed clothes and loading back onto the buses. As we returned to Jerusalem, we traveled back through the wilderness. “The wilderness” encompasses the area running east and south of the Holy City on to the Dead Sea; it is also called the Yehuda Desert or Judean Desert. Not to be confused with the desert wonderings of the children of Israel (east of the Jordon), this is the wilderness referred to in the New Testament: ‘A voice of one calling in the wilderness…’ (Matt. 3:3) and ‘Then Jesus was led by the Spirit into the wilderness to be tempted by the devil’ (Matt. 4:1). After passing through the main checkpoint into Jerusalem (there are roughly 22 in and around Jerusalem), we returned to our hotel to eat and rest up for the next exciting day of discovery. Thank you, Chic, this is the perfect way to end the day, feeling like we are walking with you throughout the land of Jesus birth. I feel humbled and blessed by the words you have written, thank you so very much.